Are you planning on a jet-set wedding celebration that will see you say ‘I do’ on a mountain top, a beautiful sandy beach, next to a famous monument or even in Central Park? 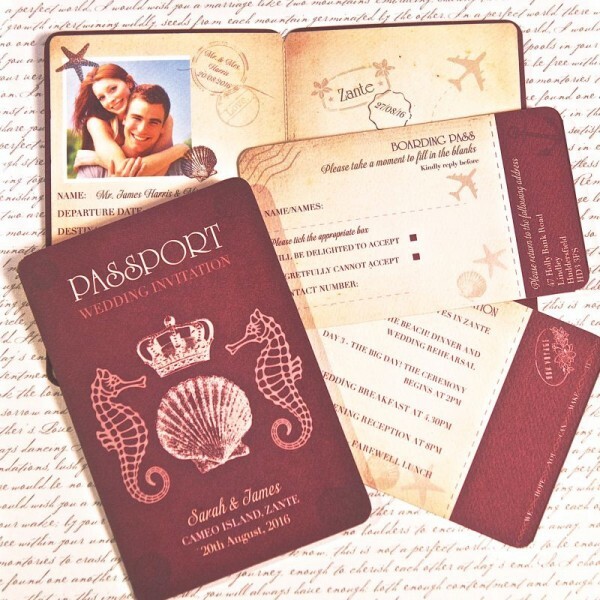 The Around the World day invitation is perfect for those who are looking to fly somewhere far-flung to celebrate the amalgamation of two families. If you’re looking to get married in Great Britain before embarking on a whirlwind tour of our beautiful country to mark the beginning of your marriage, or you’re simply planning on visiting your dream country one day soon, we feel this unique and wonderful invitation would be equally suited to you and your special day. With the front cover designed to look just like a British passport, complete with the Bride and Groom’s names, chosen destination and wedding date, this little corker is sure to instantly grab the attention of its recipients! Upon opening the 115 x 170mm invitation, your guests will be greeted by a charming picture of the happy couple, along with the all-important wedding day details and a pocket that hides a couple of hidden treats… RSVP and Guest Information card. These aren’t just any RSVP and Guest Information cards though, oh no. These little beauties are designed to look like boarding passes, keeping the jet-set theme well and truly alive and getting your guests in the travelling mood! With all of the wording totally customisable, including font and colour, plus the option to personalise your envelopes, you can be sure that this lovely invitation from Bride & Groom Direct will certainly have that ‘that’s so them!’ feel about it. Tags: Beach, Passport, Shells, Travel.